Dane Myers is on the mound for the Detroit Tigers' Low-A affiliate West Michigan Whitecaps, and he's having some difficulty already in the first inning. A walk is followed by a hit-by-pitched, and the next two batters rip into a couple of sliders that don't slide. It's quickly 2-0 in favor of the Dayton Dragons. Up in the media booth, Jesse Campbell sits behind a laptop, rapidly clicking buttons between each pitch. He is working with Trackman software, which collects the raw data that many fans are now familiar with as "Statcast data." "I track every pitch, and this thing moves kind of quickly ... I have to get each pitch logged before the next pitch is thrown," says Campbell. "Trackman focuses on these main data areas," Campbell explains as he points to a collection of data fields on the laptop screen, "the pitcher's extension and where he releases the pitch, the pitch location, the pitch speed ... it also tracks spin rate -- that's the big thing that everybody's talking about, the rotation of the pitch in RPMs." Myers throws another pitch, and a slew of new numbers populate the data fields on the laptop. It's easy to see why his sliders are getting hit: there's not enough "tilt" on the pitch. "The tilt is kind of like a clock, so like if the pitcher throws a 12-6 curve, it will say '6:00' for the tilt value." A good slider should show a tilt value around 9:00. Myers' sliders early in the game are not quite there yet, but he's been known to struggle in the first inning. With each pitch, Campbell is filling in the blanks for the software: was the pitch called a ball or a strike, did it get put into play for a hit or an out, and what was the pitch's classification. "There's some manual clean-up in classifying the pitches," says Campbell. "Trackman tells me what it thinks the pitch should be, but if a pitcher throws a slider that's maybe 77 MPH, because his fastball is 88 MPH, it might register that pitch as a curveball." Another pitch comes in, and a few more buttons are clicked: that was a fastball, it was called for a strike, the count is now 0-2, there are two outs, and Trackman is saving every piece of this information. When this game is over, the Tigers analytics department will have the raw numbers they need to evaluate this start by Myers: how many fastballs did he throw for strikes, how many sliders got turned into hits, what was his spin rate, how often did he throw offspeed pitches in 0-1 counts, and on and on. The organization hasn't always had this information. 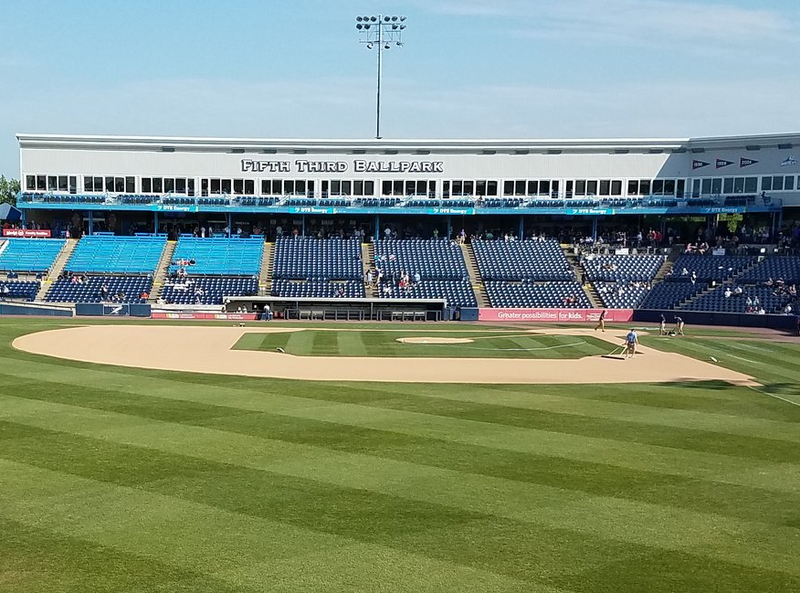 Campbell has been doing this job for two years, and before him someone else manned the software, but it's only been since 2016 that the Trackman devices have been installed in the minor league affiliate parks. Now those devices are in place at every level, all throughout the minor league system. "I was reporting directly to Sam Menzin last year but this year they expanded the analytics department, so now I'm reporting to Adam Daily, who is the head of Trackman operations across all of the minor league levels for the Tigers, so it's a growing and developing area for the organization," Campbell explains, adding that his job extends beyond just Whitecaps games. 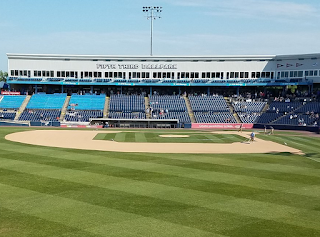 "Any game that is held in this facility [Fifth Third Ballpark], we do this tracking, so I'm not just doing this for Whitecaps games -- if there's a high school game held here, I'm in here getting this information." The Tigers are intent on having a more holistic view of the players that come through this ballpark, and capturing this kind of data helps them when it comes time to draft new talent. Campbell continues, "That was a part of their decision in getting someone like Reynaldo Rivera [the Tigers second-round draft pick in 2017] -- he was in Lakeland for a week for a tournament with his junior college, and they got a lot of Trackman data on him, so that was part of what sparked their interest in drafting him." While the Trackman system is clearly designed to deliver data that is specific to pitchers, Campbell points to an area of the application where information on the batters is being recorded: "That's the other big thing that everybody likes to focus on, exit velocity and launch angle, so this tracks both a vertical exit angle and a horizontal exit angle, as well as the hit speed." The next point is easy enough to figure out: if the Tigers are collecting this information on their own players at each minor league level, and also on high school and college games that take place in their facilities, they are certainly collecting it on the opposing teams that come to town to play the Whitecaps, the Flying Tigers, the SeaWolves, the Mud Hens, and so on. "I was really hoping to see Hunter Greene pitch in this series," admits Campbell, referring to the Cincinnati Reds first-round pick in 2017, a hard-throwing right handed starter who has been reported to hit triple digits on the radar gun. "I wanted to see if he could register 100 MPH on the Trackman system. I don't think I've ever seen that." The value of having this raw data for opposing teams' prospects is invaluable. By the time a rising star like Greene cracks the major leagues, the Tigers will already have a "book" prepared: how does he pitch to righties as opposed to lefties, where does he like to locate his pitches in certain counts, does he change his approach to pitching when there are runners on base (Trackman has a flag in the system that indicates when a pitcher is throwing from the stretch), and on and on down the rabbit hole it goes. It also gives the Tigers much more insight when the time comes to trade their own players for prospects. In 2017 when the Tigers acquired their Number 7 prospect Isaac Paredes from the Cubs in the Justin Wilson trade, Paredes had already played in five games in West Michigan with the South Bend Cubs, and Campbell was there at his post, clicking the buttons and logging the data on the young shortstop. The future, it seems, has arrived in Detroit. The Tigers are no longer "lagging behind the industry" in analytics, to use General Manager Al Avila's words from 2015. And when the World Series trophy finally returns to the Motor City, it will be at least partly because people like Jesse Campbell were sitting at a laptop, clicking the right buttons and recording the data on every single pitch.